Village Foundations is a small charity operating the Ndanga village project in Malawi for over 10 years, addressing and supporting a major village development towards sustainability through various projects concerning either water, food, health, or education based on the researched needs into the village, and at the request of villagers themselves. Major activities undertaken include a major borehole at the Ndanga project centre which provides water on a controlled basis to 10 villages and over 1000 families. There is now also limited irrigation and some crops growing (mainly maize, sunflower, potatoes, peas, Cassava) but a 'family-drip' irrigation system is urgently needed so that the project is less dependent on rainfall. Ndanga Primary school has 1,500 pupils aged 5 to 17. Many children walk up to 5 kilometers to school and are not provided with food at home before this. They used to leave school at 2pm to walk home again and hopefully to their first meal of the day in the evening. It is very well documented elsewhere that children can engage better, concentrate better, and be far more productive if they are well nourished and Village Foundations set out to change these circumstances by providing all 1,500 children with a bowl of porridge and a piece of fruit every day before they began studying. 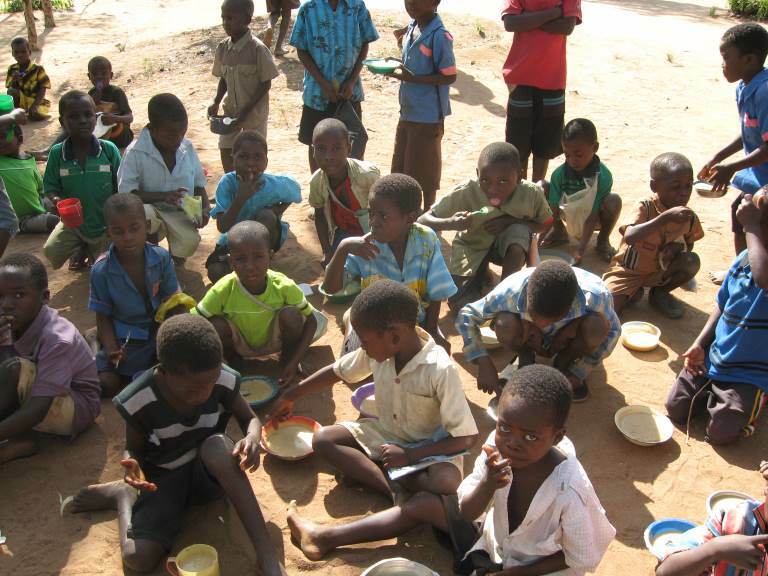 The BWCF contributed to the cost of starting this school feeding programme for three years providing porridge on a regular basis to primary school pupils. Village Foundations has now been able to show villagers how to grow soya which can be turned into flour, so that some continuation can occur. In addition they have negotiated with a Malawi organisation who intend to carry on the school feeding programme at Ndanga permanently.